We offer 50+ years of experience in rebuilding and repairing truck transmissions. 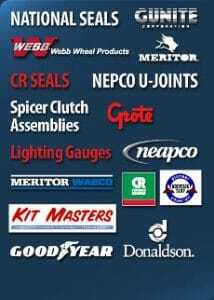 We service: Eaton, Fuller, Clark, Borg Warner, Munice, Spicer, Mack, and Rockwell. We provide high-quality truck parts and services to get you back on the road as quickly as possible. Our service professionals are able to quickly and expertly diagnose and repair your truck differential. From vibration issues to performance issues, proper assessment of your differential is critical. We can quickly acquire related parts and upgraded differential assemblies to improve performance on any drivetrain. Lyons Truck Parts has the engine parts you need for your truck repair. We sell new, used, and remanufactured truck engine components including: long blocks, fuel pumps, water pumps, radiators, PAI, overhaul kits, short blocks, turbos, filter & exhaust, injectors, belts, hoses, and more. Lyons Truck parts offers heavy-duty brake servicing including all main components and subsystems included in a complete brake system. Truck Air Brakes, Hydraulic Brakes, Foundation Brakes—we service all brake types and all heavy-duty OEM brake part components. Lyons Truck Parts offers extensive hydraulic repair and reconditioning. We carry high-quality supplier lines of hydraulic solutions including: Eaton ,Gates, Vickers, Saginaw, and Commercial. Lyons Truck Parts also offers complete Hydraulic Dump Trailer Wet Kits (Complete Installation Available). Lyons Truck Parts customers benefit from our in-house Machine Shop. We machine our own clutch fly wheels for fast turn-around on critical repairs. We also offer custom driveshaft manufacturing and precision machining. Satisfying customers for over 50 years, the custom machine shop at Lyons Truck Parts is ready to help you with your custom fabrication and welding. Whatever your needs, Lyons Truck Parts can deliver functionality and durability you can depend on. We understand that getting your truck back on the road again is important. Call or visit us today!